The Gloucester take away frequently provides catering for many private functions, including weddings, funerals and corporate function catering. 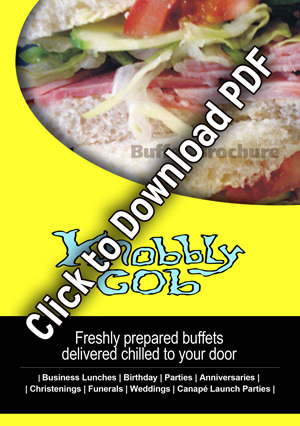 The Knobbly Cob has several tasty fixed menus as well as the ability to customise your buffet order. To find out more about the buffet catering click here to see our exceptional value buffet menus. Now days corporate catering companies provide many items in buffet catering like, oven roasted chicken, fresh garden and fruits salad, different noodles, roast chicken, Fresh cold seafood platter, king prawns, champagne oysters and smoked salmon etc. You can order for some particular party or occasion and their waiters can create great ambience and atmosphere with their service. We might be able to recommend a right location to provide accommodation to the number of people. We provide a wide range of buffet catering, Spit roast catering, dinner packs and Finger food catering and boxed lunches all at affordable cost. © 2011 Knobbly Cob.. Gloucester Sandwich Bar & Gloucester Buffet Catering.